As the season turns colder, Design Week is one year older! Baltimore’s 4th Annual Design Week returns this fall for a week jam-packed with great design events. From Friday, October 16th through Friday, October 23rd, we’re celebrating design in Baltimore with a dazzling design and dine experience, hands-on workshops, studio tours, and more. Block off the entire week on your calendar now, because you won’t want to miss a single event! Seven group sessions. Three formats. Less than thirty people per session. Plenty of time for discussion. No hashtags. No podiums. No lectures. Just you. Just them. Two whole days. the 2015 IDSA Medical Design Conference—set for Oct. 21-22, 2015 at the Center for Advanced Medical Learning and Simulation (CAMLS)(link is external) in Tampa, FL. The focused conference will be conducted by a forum of experts on the practice of medical design and its impact on healthcare on a global scale. After visiting Mall no. 1 in December of 2014, the curators of the UMOCA have given the invitation for Mall to exhibit in the museum for a full four week run from August 14th–September 14th 2015. Mall no. 2 in the context of an established art institution/museum is an exciting opportunity for Salt Lake City to be exposed to contemporary design that is happening locally, nationwide, and even internationally. The Mall no. Join a multidisciplinary team led by top design firms to help community organizations create solutions to sticky problems around Access to Care. October 12-14 you’ll rub shoulders with thought leaders, designers, health practitioners, and innovative technologists; be inspired by notable speakers; and share real prototypes with the public. Register today to join a team (space is limited). Visit IDBarnraise.com for more information. With greater use of technology, cities are collecting data, delivering innovations and enhancing lives. As Singapore moves towards building the world’s first Smart Nation, technology continues to play a key role to drive the developments. Smart Nation Innovations brings together key players - tech companies, businesses, developers, academics and organisations to share insights and spark off ideas on how to make the world move fast and smart. AIGA's “career-changing” executive education program with the Yale School of Management returns this summer! “Business Perspectives for Creative Leaders” is a uniquely designed program taught by faculty regarded as some of the world’s most experience business scholars. The 2015 Digital Signage Expo (DSE) will be held at the Las Vegas Convention Center in Las Vegas from the 11-13th of March. The Conference runs from the 10-13th of March. DSE is the world’s largest conference and trade show exclusively dedicated to showcasing innovative digital communications and interactive technology solutions for customer- and employee-facing organizations. Launched in 2004, DSE was the first event dedicated to the digital signage market and has been a significant contributor to the growth of this fast-paced industry. 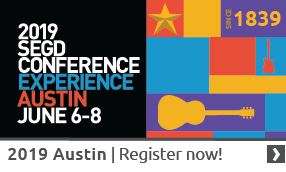 Pre-purchase the professionally video recorded, approved speaker presentations from the 2014 SEGD XLab Workshop. Please Note: All members will have access to the recorded session for free! This purchase is for non-members only. If you have problems please call 202-638-5555 so we can get you registered quickly. Please visit the XLAB EVENTpage to see details on the Agenda, Speakers, Sponsors and more. Salt Lake Design Week happens October 13-17 with a full slate of events celebrating the impact that design has on the community. SEGD events are part of the mix.